Unlike Spring's frantic northward migration, post-breeding animals seem to move at a slower pace. "Fall" migration actually begins in July, even while many of our local birds are still raising families. The last of the stragglers can be seen moving through the New York City area by the beginning of December. 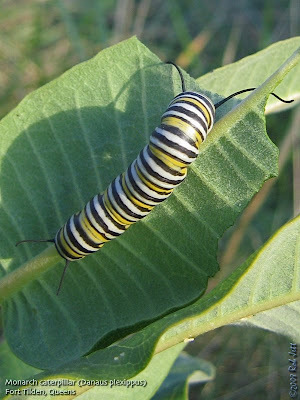 On a recent trip to Fort Tilden, I found this Monarch caterpillar feeding on a Milkweed plant. These extraordinary creatures take three to four generation to migrate North. The final generation then turns around and flies to its wintering ground in Mexico. I've done a little exploring over the last couple of weeks, but have had trouble keeping my blog updated. My productivity levels have been like that of the Monarch. Traveling in short spurts, I find myself periodically stopped and wrapped in a tight chrysalis. With October approaching, perhaps I will emerge as the fourth generation re-energized for a long, productive flight. 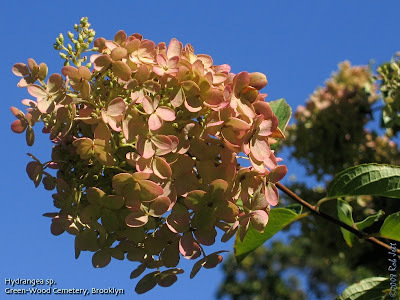 Earlier in the month I began taking photographs of the fruiting plants around Prospect Park and the city. Most images are of species that I've observed migrating birds relying on for food each fall. 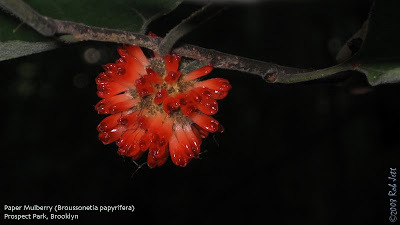 Papermulberry, which is considered invasive, provides a food source directly and indirectly. I've watched orioles and tanagers eat the fruit, but also seen warblers probe it's sticky, juice covered surface for trapped insects. Polkweed berries are a favorite fall food for robins and other thrushes. Cedar Waxwings will also fill-up on these "inkberries", but they are a little too large for warblers or other small songbirds to digest. I lead a trip in Prospect Park for the Linnaean Society early in the month. Near the Lincoln Road entrance we observed an interesting plant with white berries. Someone thought it might be called "Doll's Eyes". At home I learned that it was called "Snowberry". 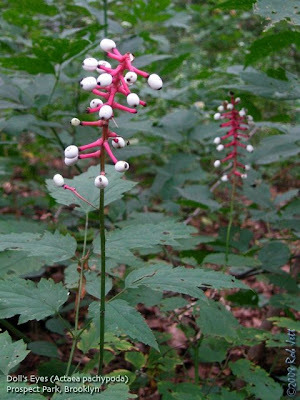 On a subsequent walk, however, I did find a small stand of "Doll's Eyes" growing near the south end of the Midwood forest. The unusual fruit sprout from a pink, optic nerve-like stalk. Kind of creepy. I'd never noticed them in the woods and wonder if they are a recent planting. 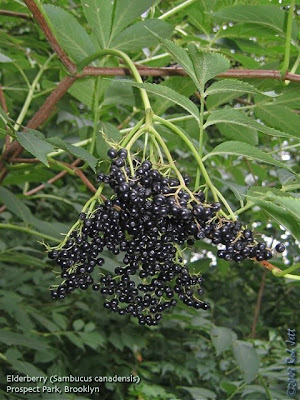 By far the most popular autumn fruiting shrub in Prospect Park is the Common Elder. Catbirds, mockingbirds, robins, titmice, waxwings, orioles, you name it, they seem to the love it. Some shrubs are so laden with fruit, that their umbrels bend horizontally under the weight. They are edible to humans, but from what I've read, they are rather tasteless to our buds. I guess it's an aquired tastes, especially in the form of Elderberry wine. 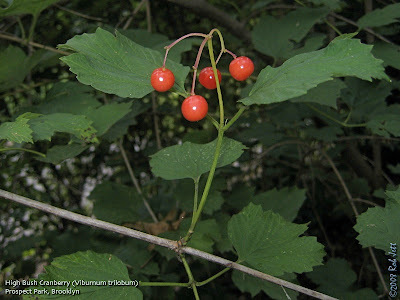 High Bush Cranberry has been replanted in many locations around Prospect Park. 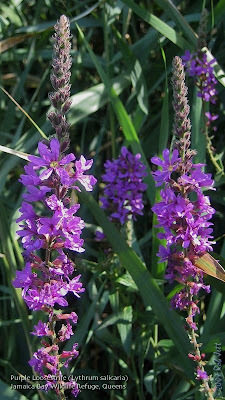 Many large stands of these shrubs border the waterway from the Upper Pools, through the Ravine and down to the Lily Pond. While I waited for a sunny morning to photograph these bright, red fruit, migrating birds nearly finished off this season's harvest. I did manage to find some remaining on a shrub near the entrance to the Ravine. Aralia Spinosa or "Devil's Walkingstick" is frequently overlooked as a magnet for migrating birds. 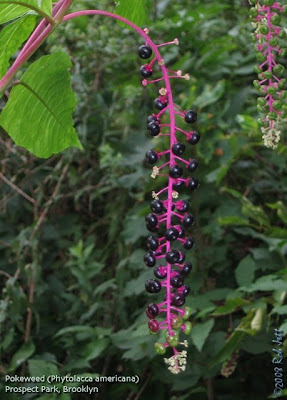 The spiny trees produce small, dark purple berries in circular clusters at the end of the panicles. The individual berries are tiny enough that I've observed them being eaten by warblers. Black-throated Blue Warblers, especially, seem to be fond of them. 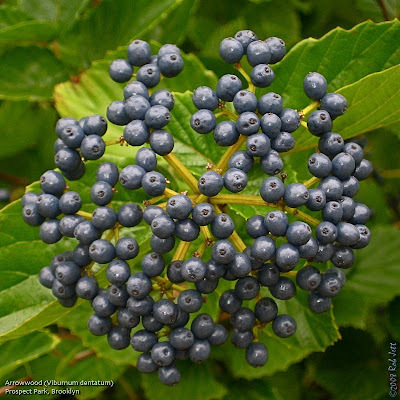 Another shrub that has been providing an abundance of food for fall migrants is Arrowwood Viburnum. Myself and several other birders were fortunate enough to observe a Philadelphia Vireo feeding on the silver-blue berries of one near the Lily Pond. Philadelphia Vireo are rarely seen on migration and easily misidentified, but we were fortunate that this bird was hungry and enjoyed the viburnum berries. He returned on several occasions and ate fruit from a shrub only a few yards from where we stood. We had long looks at this olive and yellow bird in bright, morning sunshine. Yesterday afternoon I took the bus down 5th Avenue to Green-Wood Cemetery. Marge persuaded me to meet her for a little autumn birding (didn't take much). 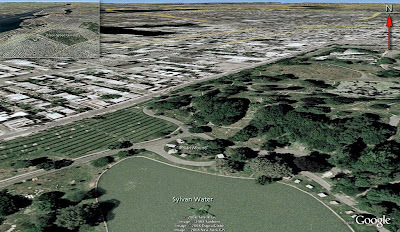 Her friend, Alison, mentioned that she had observed a lot of bird activity near the Sylvan Water, in particular, around the hill where Do-Hum-Me was laid to rest. We met beneath the spires of the main entrance then drove to the Sylvan Water, where we parked and walked up the gentle slope of the "Indian Mound". The small, roughly, circular area is dominated above by a mature elm tree. Lower down, on either side are small, fruiting dogwoods and a Yew tree. Behind the elm and across Lake Avenue is a long, high ridge. On the steep rise are several mature conifers close by. A Golden Raintree and linden are just to the west. We stood on the grassy mound between two rows of headstones edged by carefully manicured boxwood, yew and arborvitae shrubs. What we observed in the relatively tiny, sculpted landscape was nothing less than amazing. There was a mixed flock of songbirds feeding, primarily, in the elm tree, but moving in a circuit from elm, dogwoods and yew next to us, then along the trees on the ridge and back to the elm. When we stood on the road beneath the elm and faced into the sun, we noticed millions of tiny, white flies, perhaps the focus of their feeding frenzy. The bird activity was not restricted to the trees. Skulking in the grass at the base of the ornamental shrubs were two Swamp Sparrows and a Lincoln's Sparrow. An Indigo Bunting also made an appearance. 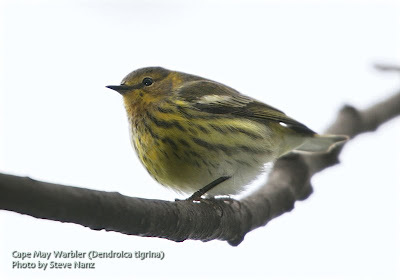 Of the warblers in the elm tree, likely the most uncommon was a Cape May Warbler. Unlike their Spring migration treetop foraging, this bird gave us long, eye-level looks as it picked insects from the tree's lower, drooping branches. Black-throated Blue Warblers, which were the most numerous warbler, spent much of their time eating berries from the Yew tree to our left. It wasn't just warblers, however, that were feeding in the elm tree. Three species of flycatcher - Eastern Wood-Pewee, Eastern Phoebe and Great Crested Flycatcher used the tree to hawk for insects. A nervous Scarlet Tanager plucked fruit from the Yew tree, then flew into the elm to eat them. A pair of Red-breasted Nuthatches clambered up and down the trunk and probed the fissured bark for bugs. At one point, I spotted our friend Mike walking down Lake Avenue. I waved him over. He had been birding in other parts of the cemetery and said that he hadn't seen much. That's because all the birds were in this one spot, I explained. We gave our necks a break from staring up into the trees when I spotted the Lincoln's Sparrow near the base of a shrub. (The following sentence will probably be a first in the context of a nature journal.) Using the largest headstone as a blind, we quietly waited for the beautiful, nervous little sparrow to emerge from hiding. Eventually, it hopped out into the sunshine where it nibbled on grass seeds. Because of their wary behavior, these delicately marked sparrows are rarely seen, and not actually rare. It was a great opportunity to study one. We ultimately tallied 13 species of warbler in that elm tree. A Common Yellowthroat, which never made it more than a few feet from the ground, was our 14th warbler species of the day. Of the total 54 species on our list, only 20 never set foot in the towering elm tree. In fact, at one point we thought they'd all be gone for good when a Red-tailed Hawk momentarily perched in it. I guess it just goes to show that sometimes it is best to stay put and let the birds come to you. Notes: Observations made at Indian Mound. 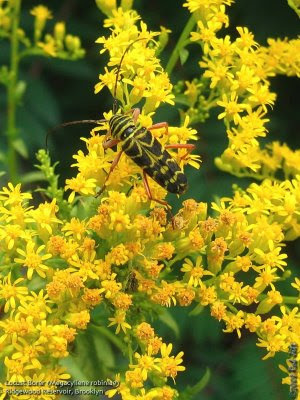 This coming Friday, September 26th at 6:30pm, scouts from Ridgewood will look at bugs 3000 times their actual size thanks to insect expert Steve Nanz. Mr. Nanz will photograph the insects and the images will immediately be displayed on a large laptop computer screen. Kids of all ages will get to see a surprising array of our local critters as never before. For the purpose of this program, the insects are lured to a large white sheet by a portable black light. An example of the process can be seen here. Mr. Nanz will talk about the color and shape of the various insects and their importance to the diversity of the local environment. This scout program is the first nature program to be held this year in conjunction with the Highland Park-Ridgewood Reservoir Alliance. HPRRA is a group of concerned citizens trying to preserve the reservoir from development and, instead, create a protected urban nature preserve and education center. The Ridgewood Reservoir has been called the "Jewel of Brooklyn and Queens." 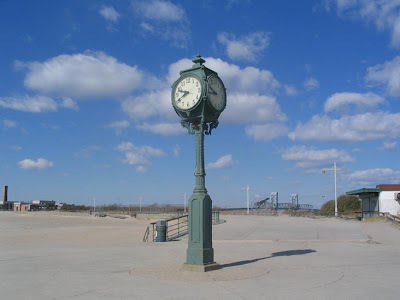 On Saturday I lead a trip for the Brooklyn Bird Club to Fort Tilden and Jacob Riis Park. The wind conditions were less than ideal for fall migrating birds, but there were some highlights, including a very oddly plumed sparrow. Overnight Northeast winds switched to the east and by late morning were nearly non-existent. Flocks of migrating Blue Jays looked confused as they moved both east and west across Ft. Tilden and Riis Park, circling the area. 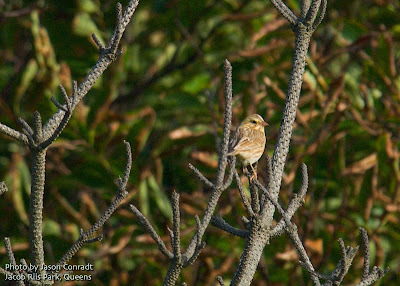 The best sighting of the day was a female Dickcissel located at a stretch of grass near the boardwalk just east of Beach 169th Street. Seconds after spotting the Dickcissel, Tom Preston and I noticed an odd sparrow perched nearby. 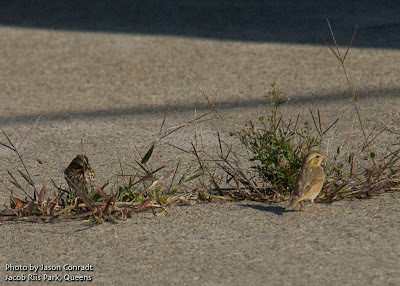 There were several Savannah Sparrows and Song Sparrows in the vicinity that flushed as we walked across the grass. This bird's general shape and structure was that of a Savannah Sparrow, but with muted colors that seemed odd and unfamiliar to me. It had the yellow facial wash one would expect on most savannahs, but, among other interesting features, had an unusual buffy-colored collar. The "Ipswich" Sparrow race of savannah is very pale, but should be noticeably larger than our typical race. 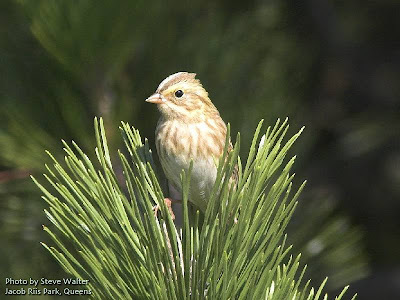 James Rising's "A Guide to the Identification and Natural History of the Sparrows of the United States and Canada" mentions that there are 12 subspecies of Savannah Sparrow, so perhaps it is just a form that is uncommon around New York City. 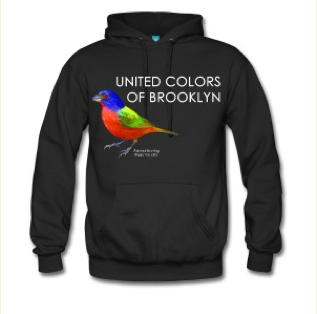 I've also considered that perhaps this individual bird has a pigment deficiency. Jason Conradt and Steve Walter were present and took some decent photographs of the bird. If you have any insights, I'd appreciate your comments. 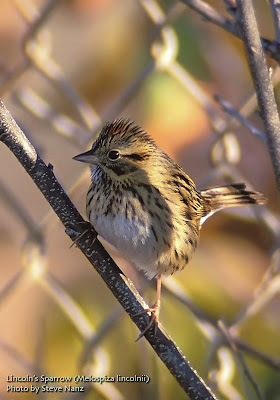 "The sparrow looks to me like an erythristic Savannah Sparrow. That is an individual showing only the Phaeomelanin (red) pigments and lacking eumelanin (black pigment)." On a lark I thought I'd email David Sibley and see what he thought. He thinks it might be leucistic. This is a fun little mystery. I'm a birdwatcher from Brooklyn, NY (Chelmsford, MA originally) and I've stumbled across a sparrow I can't identify. I think it's an Ipswich Sparrow but the dark streaks in the primary and covert feather tips are very pale. I was wondering if you thought this could be a partial albino or possibly another variant that isn't illustrated in your book. 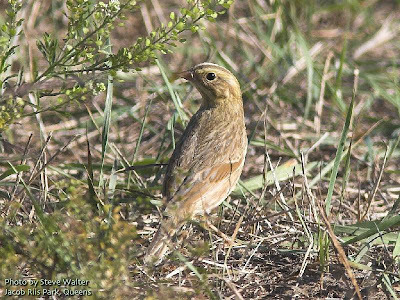 I saw the bird on a walk led by Rob Jett of the Brooklyn Bird Club at Fort Tilden. I attached some photos that I took and you can check out my Flickr page if you're interested in seeing more of them. If you have time please let me know what you think. My wife and I love your books. From the photos I would say this is NOT an Ipswich, too much yellow on the face and too much red in the wings and body. Ipswich should look grayer overall with hints of pinkish, and virtually no yellow on the face. So this is most likely to be a "dilute plumage" or "leucistic" Savannah from one of the common subspecies, lacking some of the brown or black pigment. Interesting bird. I began this piece the day before my accident, so forgive me if it seems a few weeks late. 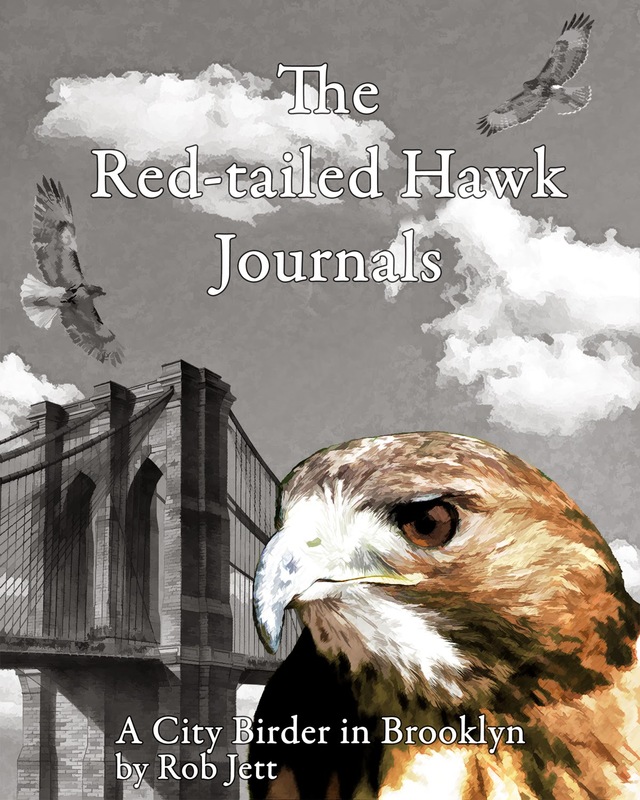 "Warblers and hawks can be exasperating; shorebirds can be ego crushing. Warblers and hawks generally escape us by dropping into the bushes or flying over the horizon, so there's always bad luck to blame: "At first I couldn't see it, then it disappeared." Too often in shorebirding, the unident stands right there, thirty yards away, waiting patiently while we first flip through our field guide, then backward more slowly, checking all the plumages, then forward again, this time being sure to check the pages with the Eurasian vagrants, and it's still standing there when at last - meekly and painfully, hoping no one is watching - we close down the scope and walk on." Last year I posted a couple of short pieces about a celebrated New York City birder named Tom Davis. You can read them here and here. I never met Tom as he passed away long before I began birding, but Peter Post kindly sent me two photos from back in the '60s or '70s. 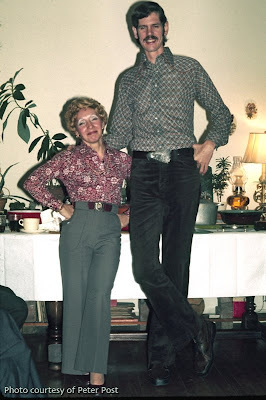 I had heard that Tom was tall, but after seeing the photos, I think "towering" would be a better description. I mention Tom Davis for two reasons. First, it is my understanding that Tom was not only a skilled, passionate birder, but also a great teacher. Shorebirds were his specialty and he went to great lengths to find, identify and share with others his discoveries, understanding and love of these long distant migrants. 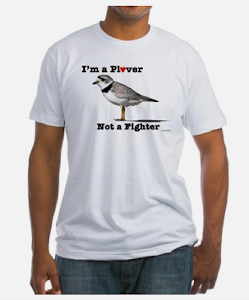 His name is attributed with many of the state's records of rare shorebird sightings. 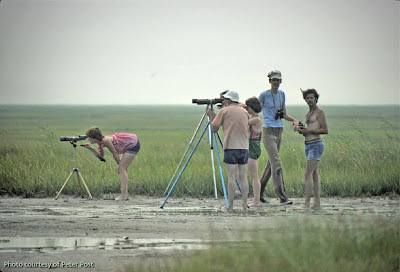 For many of New York's long time birders, it is difficult to discuss "Jamaica Bay Wildlife Refuge" and "shorebirds" without recalling a Tom Davis anecdote. I'd like to learn more about Tom and help keep his legend alive. As with last year's posting, perhaps readers who knew him could add a brief mention in the comments section. Birding, as a recreational activity, has a tradition of passing on knowledge to the next generation of birders. From my perspective, birding is not just about finding birds, it's also about sharing. Sharing my enjoyment of nature discovery was my motivation for creating this blog. In the spirit of Tom Davis' love of shorebirds, for the last 15 years the Linnaean Society of New York has hosted an "Annual Tom Davis Shorebird Walk" at Jamaica Bay Wildlife Refuge. This year the walk was on August 23rd. For the 5th consecutive year, my good friend Sean Sime was the trip leader. Tom Davis is a tough act to follow (especially at 6' 8" tall), but Sean's detailed knowledge of shorebirds, relaxed demeanor, excellent teaching skills and sense of humor always make for a good trip. In the weeks prior to the walk, circumstances that only the birds would know (and they're not talking) lead to an unusual appearance of rare birds at the refuge. I suspect that most people who attended the walk had high hopes that there would still be some of these rarities present. 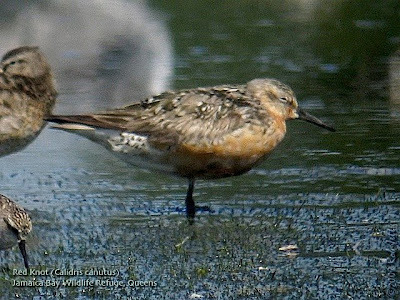 I knew that it had been a while since the Red-necked Stint, Sharp-tailed Sandpiper and Wilson's Phalarope were reported at Jamaica Bay, but would be just as happy to spend my time studying the more common "peeps." I welcome any opportunity to learn more about identification from Sean, whether the shorebirds are rare or common. Our group met at the visitor's center a couple of hours prior to high-tide. Sean's strategy was to have enough time to bird the West Pond area, then walk to the East Pond at the peak of the tide cycle. There weren't any unusual birds observed that day, but it did allow us to spend time learning more about the "peeps" conundrum - Least Sandpiper, Semipalmated Sandpiper, White-rumped Sandpiper (and, if they were present, Western Sandpiper and Baird's Sandpiper). The "best" shorebird of the day was a trio of Stilt Sandpipers seen on the East Pond. For me, one of the more enjoyable aspects of watching birds, is observing their behavior and we had an interesting experience that day. As our group was exiting the South Flats section of the East Pond we spotted something fascinating. Several groups of migrating swallows had been seen flycatching over both the West and East Ponds. They were primarily Tree Swallows, but there were also a small number of Bank Swallows present. At the south end of the East Pond I pointed out a Bank Swallow to some of the birders who had missed it earlier. As we were watching the bird, it dipped down towards the surface of the pond and picked up a white feather floating on the water. The bird carried the feather several yards into the air, then released it. As the feather fluttered towards the pond, the acrobatic swallow swooped down and caught it. It repeated this apparent game of catch several times as our group looked on in amazement. We discussed the possible motivation for its behavior. Some people thought that it might be a young bird who was practicing his or her insect hunting mastery. It sounds plausible. Perhaps play IS sometimes an activity that hones an animal's survival skills, but just as humans enjoy playing, could it also be that sometimes play is simply just fun even for birds? 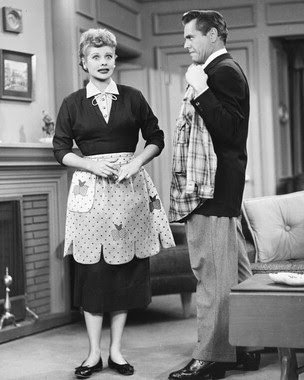 On the classic television comedy "I Love Lucy", Lucille Ball's character was forever finding herself entangled in some kind of mess. Her husband, Ricky, would more often than not, catch on to her situation and demand in his heavy Cuban accent, "You have some splainin' to do." Well, after a three week slow down, I think it's time for me to do some "splainin". I love the ocean. As my mother tells it, I was a regular water baby and hard to keep out of the surf, pool, lake, you name it. My preference is for the ocean, though, because I love the waves. When I was in Junior High School, I would take the bus from Queens Boulevard, in Rego Park, to Rockaway Beach on the weekends. I never got into board surfing, but I loved bodysurfing, no doubt for the same reasons that seals enjoy it. As some people get older, they tend to set aside the fun things of their youth. During my High School years I discovered recreational cycling. I was one of a small circle of friends who pedaled all the time, some of it long distance. My friend Roger and I twice rode from Forest Hills, in Queens, to Orient Point, on the north fork of Long Island. Of my cycling buddies from that period, I am the only one still riding. Roger, I was told, gave up bicycles for motorcycles. I also never retired my love for bodysurfing. Without the use of a surf board or boogie board, zipping through the water using just my body to navigate is a joyful, almost euphoric experience - most of the time. Which brings me to 3 weeks ago. On Sunday, August 24th, Hurricane Faye was in the Atlantic Ocean somewhere due south of New York's barrier beaches. The night before I decided I wanted to race my wife to the beach. She would take the subway to the bus and I would cycle down to the beach. We would meet by the Wise Clock. I gave her a 10 minute head start to get to the subway before I took off. Despite a slight headwind, the weather was perfect for riding. The last stretch before the beach is the Gil Hodges Bridge. While I was crossing it, one of the beach buses passed me by. Damn. Just as I pulled onto the boardwalk my cellphone rang, the voice on the other end said, "I just got off the bus." We got to the clock at the same time. The waves were huge and coming straight in towards the shore. By high-tide they were breaking about 20 yards from shore and in fairly deep water. Nice. I spent most of the afternoon riding the best body surfing waves of my adult life. Riding most of the same waves was a tattoo-cover man about my age next to me. He was also having the time of his life. At one point he said to me, "My kids are bored and want to go home, but these are the best waves I've ever seen at Riis Park, so they're gonna hafta wait." We must have looked like two overgrown kids. Finally I decided it was time to dry off and get ready to pedal back to Park Slope. When birding, I tell people that there's always one last bird, so if I'm exiting Prospect Park, I'll stop and look around before crossing the street and going back into the neighborhood. On August 24th, I decided that there was one last wave to ride, turned around, dove through a breaker and waited for the next big one. It came, alright, and I messed up big time, waiting too long to pull out of the break, and got clobbered. I was tossed around like a pair of boxer shorts in the spin cycle of a washing machine, then slammed, shoulder first, into the sandy bottom. I immediately knew something was wrong when I stood up and touched my shoulder. It felt like my arm was hanging down a few inches lower than normal. 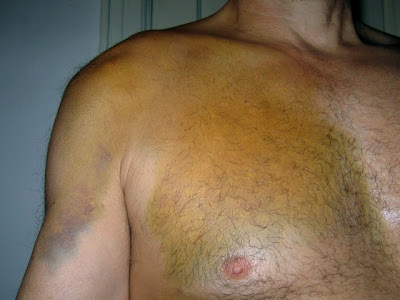 Then I felt a large bump on my collar bone ... 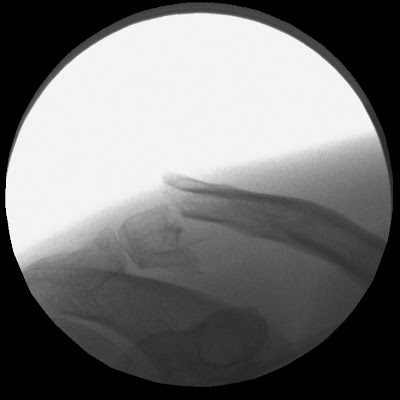 Yes, the adjacent image is my actual x-ray and you don't need to be a doctor to find the fracture. Ouch. The good news is that I didn't break my neck, the bad news is that I did break my collar bone. Oh well, what can I say except crap happens. For this type of injury there isn't a whole lot, medically, that can been done. I'm supposed to relax, ice it, keep my arm in a sling and be patient. My doctor promised that I should be back to normal (or as close as I ever was) in 6 to 8 weeks. Thankfully, I can still use my binoculars with two hands, but it does get real painful after a while. I need to limit myself and know when to stop and go home. I'm sure that anyone who knows me will likely laugh when they read that "note to self". As for my future in the professional bodysurfing circuit, I think that dream is over, but come next summer, I'll still be out in the surf with one other crazy old man. I've been birding a few times since my accident and have a bunch of photos and sightings that I'll try and post by the end of the week. 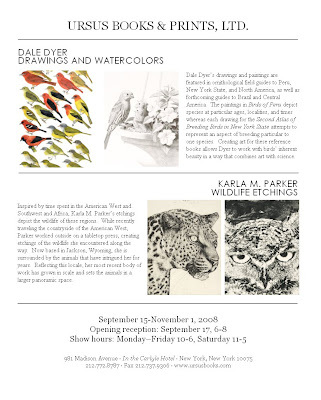 My friend Dale Dyer is having a showing of his bird drawings and paintings at Ursus Books & Prints, Ltd. In addition to being a talented artist, Dale is an excellent birder. 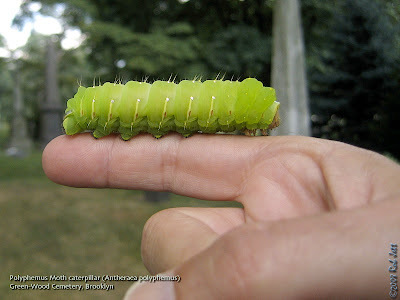 In fact, he was the first birdwatcher that I met when I began looking at birds in Prospect Park. I remember it as if it was yesterday; he was extremely helpful, pointing out for me the subtle differences between some of our woodland thrushes. Learn more about Ursus Books & Prints, Ltd. here. Let me know what you think of the new maps menu in the sidebar. Eventually, I'll have pulldown menus for each of the five boroughs. 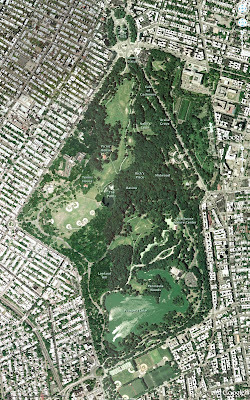 This coming Sunday, September 7th, I will be leading a birding trip in Prospect Park. 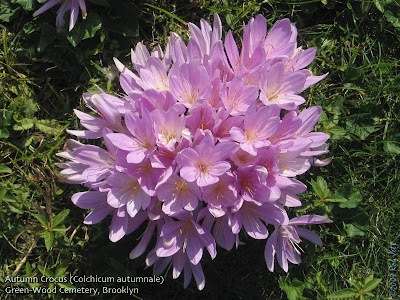 The trip is organized by the Linnaean Society of New York. There is no registration necessary and we meet at Grand Army Plaza in front of the Stranahan Statue at 7:30am. The statue is next to the path at the northeast corner of the park entrance. Following my most recent posting, I received a question regarding birds that migrate through New York City. First, I apologize to anyone who posts a question if their comment does not appear on the blog right away. When I am out of town I don't always check my blog. Since I've been forced by spammers to moderate all incoming comments, I need to manually check all incoming comments, then decide to "Publish" or "Reject". Marie asked, "...don't the birds have to stop, to rest, eat, sleep, before they reach the Gulf of Mexico? I keep trying to incorporate bird-friendly plants into my rooftop gardens but perhaps I am mistaken in thinking that many of the them rest in the city?" Most birds, with a few exceptions, do need to stop, rest and refuel at various points along their migration route. It is for that reason that urban parks, backyard gardens and roof gardens are so important to these animals. Renewed interest in roof gardens is great on many levels, from moderating urban heat island effects to creating oases for migrating birds. I hope I didn't give the impression that migratory species don't rely on NYC parks and gardens for help. They certainly do. Marie and anyone else designing gardens for wildlife shouldn't change their sales pitches, birds can always use our help. Biologist Scott Weidensaul wrote a great book entitled, "Living on the Wind, Across the Hemisphere with Migratory Birds." He explains and follows the routes that some of these long distance migrants make twice a year. 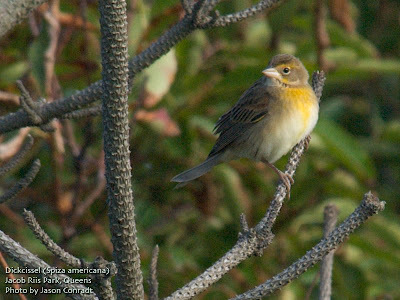 A large percentage of the neotropic songbirds that we see in the northeast are trans-Gulf migrants, which means that the non-stop portion of their flight is between the Yucatan Peninsula and the coast of Louisiana. 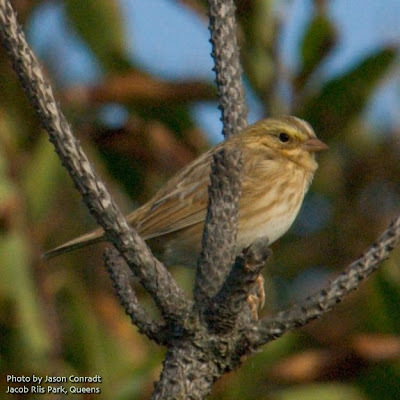 Some Blackpoll Warblers will fly for 40-50 hours over the western Atlantic Ocean on their southbound journey. Many, however, stick close to the coast and can be seen in our local parks during migration. A contender for the "Most Incredible Fall Migration by a Bird" Award is a large shorebird called the Bar-tailed Godwit. 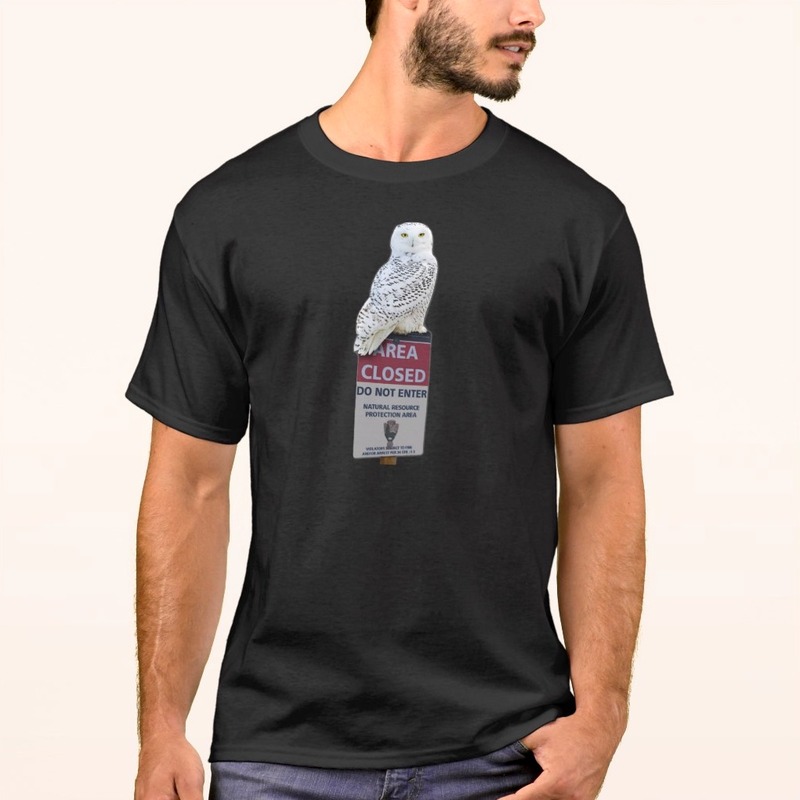 They will fly from their nesting grounds in Alaska to their wintering grounds in New Zealand, a flight that can easily last 4 to 5 days, without resting! They can't swim, so stopping for a dip in the Pacific Ocean would result in drowning. In my warped mind, I imagine a family of godwits heading south, with one juvenile, smart-assed godwit at the back of the flock making his first trip. He might be sounding a lot like Bart Simpson - "Are we there yet? Are we there yet? Are we there yet? Are we there yet? Are we there yet? Are we there yet ..."